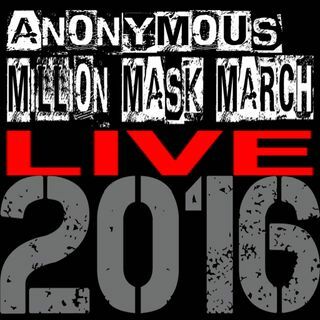 It is November 5th 2018, Welcome to the 3rd annual Million Mask March Live on The 5 broadcast. eventually the tree blossomed with tens of thousands of beautiful flowers each one different, yet still the same. Nature dictates that beauty and strength attract praise and conflict, support and subterfuge. in time the tree ... Maggiori informazioni became sick and withered, not even the strong roots could save it. The termites ate the tree until there was nothing left but a pile of dust. Then the termites all died because there was no more tree to eat. as the tree died, the thousands of flowers fell to the ground planting hundreds of thousands of seeds. growing into an impenetrable forest that all the termites in the world couldn't ever destroy. we are the razor sharp fragments of the shattered guy fawkes mask. we are everyone and and we are no one, but make no mistake, we are everywhere. their system that oppresses us all. Today we fight for justice for ALL our fallen brothers and sisters murdered by the state. Today we fight for ALL power to be given to the people. Today we fight so future generations of humans don't have to. It's time to stop clinging to what was, and embrace this evolution. As many things change, some will always remain the same. We do not forgive. We do not forget. Expect Us. Are we still love here?